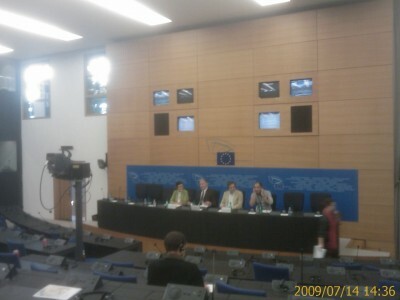 *Strasbourg/Angelo Marcopolo/- Speaking to Journalists, including "Eurofora", after an Exceptional Inter-Ministerial Gathering on Preventing Radicalisation, French Prime Minister Edouard Philippe, announced a "New Strategy", following an analysis of Strasbourg's Terrorist Attack (December 2018), which, however, apparently still leaves some Key Questions open, as it results from what told us also the City's Major, f. Senator Roland Ries, in a subsequent Press-point, (See Infra). 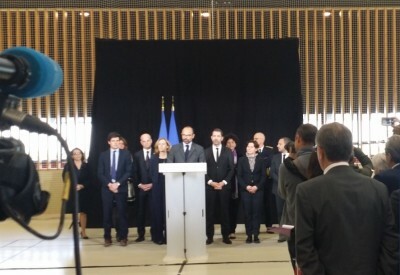 The main Aim was to Take Stock of 1 Year of Anti-Radicalisation Policy of the new Government (2018-2019), and to Decide on the Measures needed for this 2nd Year (2019-2020), Considering also the Lessons learned, Meanwhile, with the December 2018 Islamist Terrorist Attack against Strasbourg's Christmas Market, where 5 innocent Civilian People had been Cowardly Targetted and Brutally Murdered, several others wounded, during EU Parliament's Session, (Comp., f.ex. : ..., etc). On this Occasion, 3 or 4 of those Ministers would Visit various relevant Events organized around Strasbourg and other neighbouring Cities, for several actions on JHA, Universities, and even Sports, etc. - "ISIS has Fallen Down. After 5 Years of Terror, its Territorial Control in Syria and Iraq has been Demolished, thanks to the action of the International Coalition and of our Armies", the French Prime Minister pointed out from the Start, in his Press Statements, (after the Meeting was Extended 1 Hour More than what had been initially scheduled). - But, "we must Not Lower our Guard". Because "Battles are going on not only in that Syrian-Iraqi area, but also Elsewhere in the World, and even Here, in our Land", he Warned. Indeed, "We Know that the Endogenous (as he called it : See Infra) Terrorist Threat still stays, that she evolves, she has Not Disappeared. The Recent Attacks prove it", he noted, soberly. - Meanwhile, already, "since February 2018", "our 1st Priority always is Not to let Centers of Radicalisation free to act, but Fight Against those who push them", Philippe reminded, as far as Stock-Taking was concerned. => Thus, f.ex., "we went, in a Spirit of Republican Riconquista, ... to Regain our Internal Borders : .. In the Suburbs where we Focused our Action, 4 "Schools withOut Contracts" were Closed, 7 Places for Worship (including a Salafist Mosque) were Closed", while a New Law "renovated the Monitoring of Private Establishments withOut Contract, in order to Avoid composts of Radicalisation", so that "the Procedure of Opposition to their Opening was triggered for 15 Times" until now. - "But this Fight against Radicalisation must also take place even Inside the Schools of the (French) Republic", he added. So that, f..ex., "Secular Units were set up in each Academy, 350 Professionals Trained, ready to Help Teachers to face eventual Attacks against Republican Values", and "more than 1.000 Situations were Noted and Treated : While Before that, they existed, but were often Silenced, Hidden or escamotated, from Now on, we Face them", he stressed. 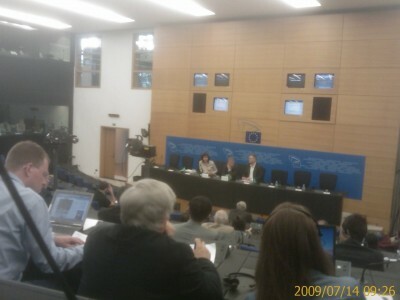 + And, "in our Times, full of Fake News and Plot stories, Needing to develop a Critical Spirit to our Youth, ..and the Intellectual Tools allowing to take Distance and raise Questions, More Efforts are necessary": F.ex., "on 2019, the Week of Press and Medias in School mobilized more than 18.000 Establishments, in cooperation with 2.800 Médias partners". + Similar Struggle also "inside Prisons, ...where, f.ex., the Building of WaterProof Quarters was Accelerated, in order to Separate from Ordinary Inmates, those Detainees Condemned for Terrorist Crimes, or Spoted as Radicalized". And "we Accelerate the establishment of PluriDisciplinary Teams to Monitor Radicalisation and Accompagny Detainees in their process of Disengagement", while also "Strengthening the means of Penitentiaries' Intelligence", etc. ++ Moreover, "this Fight has also to be fought even inside the World of Sport", f.ex. in "Gyms", etc. : Because "we Refuse that Sport, in general, a number of Associations or Equipments, become areas of Communautarism and withdrawal/closure" : So that "a Mechanism of Sensibilisation, set up by the Ministry of Sports, has mobilized Nowadays 2.000 Actors specialy Trained, and 34 Sports' Federations have now a "Citizenship referant", (etc). 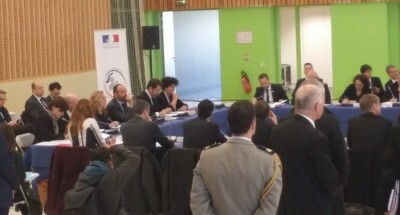 +++ At the Same Time, "Efforts were made to Return Back from our (France's) Borders, to Expel from the National Territory, those who came to import Hate and Division : Since April 2018, about 300 Aliens in Irregular situation, Registered in the Files for prevention of Terrorism-related Radicalisation ("FSFRT"), were Pushed Away or Abandoned the National Territory", he pointed out. => This State of Affairs might be Positive, But, Obviously, we are Not Satisfied by that", and "we Want to do Better", Philippe critically vowed for the foreseable Future. 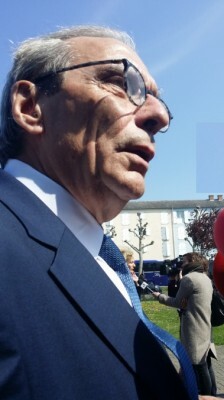 - "One of the points seen at Strasbourg's Attack is that there Can be a Continuum between (ordinary) Crime, Radicalisation and Terrorism", he noted, (concerning, however, a phenomenon already seen elsewhere before, among several recent Islamist Terrorism Murders cowardly targetting Civilian People, as, f.ex., in the UK, elsewhere in France, etc, while also "Radicalisation in Prisons" was notoriously growing). "Delinquancy does not necessarily lead to Terrorism, far from that", "but" there is "a Porosity which May Lead from one to another", he noted soberly. => So that "his (Murderous) Act reveals the collective Incapacity of all (Public) Actors to Stop a Worrying Drift, to Stop a Criminal Drift, which, at the End, fusioned with a Radicalisation path", Denounced Philippe. >>> "That's why I wished ... a New Strategy to Prevent Delinquancy", the French Prime Minister announced. - "This Strategy must be Coherent with all the Other Public Policies supported by the Government : The Public Security policies, which have a Priority in Suburbs for Republican Reconquista, but also the Strategies of Fight against Poverty, the Strategies for Protection of Children, and for Mental Health, (etc)". - "Because when a Kid or a Teenager Drops out, this is due to Multiple Factors - Familial, Social, Psychological - and they must be apprehended in their Globality, if we want to be able to bring a Credible and Sustainable Reply", he stressed. - "This Strategy will be built around certain Simple Ideas, that I shall Highlight :"
- "At First, we must intervene Earlier and Faster", the French Prime Minister warned. "The 2013-2017 Strategy to Prevent Delinquancy was Focused on the Public of 12-25" Years old, he reminded. But, "we observe -as also all (public) actors did- that there is either a General Rejuvenation of Culprits, or, at least, they Surface at a Younger Age, which Needs to develop a capacity of an Intervention, Detection and Action much Earlier". + "I also propose to give to Local Actors, First of all to Elected Local Representatives, as many of them ask, the Means to Intervene vis a vis those Youngsters and their Families", Philippe added. F.ex., "the Family of the above mentioned Terrorist had been Followed by various Services during a Long Time, but, there too, withOut allowing to Avoid that Drift". => "We must Strengthen our Action there", he added. ++ "3rd simple Idea : We must go and Find those Youngsters there where they are, i.e. 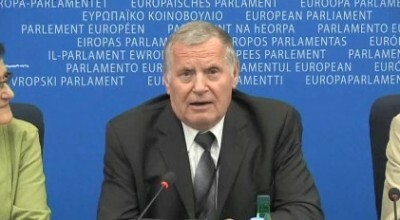 often in the Streets, often at the Internet, withOut Waiting to detect them inside the Institutions", Philippe urged. "Thus, we have a lot to do in order to ameliorate Mediation work, including by Night, in Mobility, at the Internet and Social Networks", he pointed out. 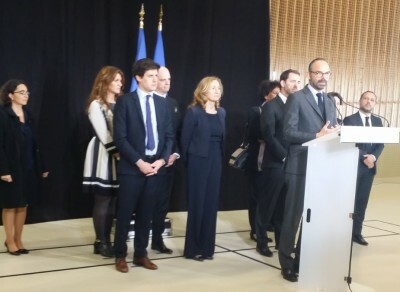 +++ But, in parallel, he pointed also at the Creation of a "Scientific Council on the process of Radicalisation", which was Decided just 1 Day After the December 11, 2018, Deadly Islamist Terrorist Attack in Strasbourg (by Decree of 12/12/2018): Even earlier Today, when we met with one of the Associations workin to Prevent Delinquancy, they spoke themselves about the Need "not merely to act, but also to Think, Understand, and Develop Research in those matters", as he said, referring to "the 1st Time that this Scientific Council on Radicalisation process met on April 2 (2019), co-Chaired by the Minister for Universities, Research and Innovation, Frederique Vidal, and the JHA's Secretary of State, Laurent Nunez", (comp. Nunez' Reply to "Eurofora"s Question, at: ..., etc). >>> -"This Council is a Unique Initiative in Europe, in order to boost Dialogue between Institutions' representatives, Security actors, and Researchers in Human/Social Sciences", Philippe stressed : "In fact it's very Important", because "it's Indispensable to Understand Better, and to Know Better, in order to Better Act, more Efficiently", and "I Expect very much to EnLighten and Help at the Public Decision-Making" process, the French Prime Minister concluded. => - "From Today, Opens a Period of Time for Concertation with Elected Representaives, on this "New Strategy" to Prevent Delinquancy, and this will durate Until the Summer" 2019, so that "it wil allow us to ...see Where those Tools which had been initially set up by a Law of 2007 (i.e. Before the Islamist Terrorist Attacks) on Preventing Delinqancy, must be Consolidated, and where they must be Adapted" to the new situation, Philippe concluded. - No, I have Not been yet Informed neither about the concrete Content of that Phone Call, Nor about whether it might have been Important, or Not, for what Triggered those Attacks, Ries replied, in substance, to "Eurofora"s relevant Questions, leaving them Open and still Pending, in either ways ! Indeed, EU Parliament's work was Seriously Affected by that Deadly Terrorist Attack, since, inter alia, all People working there were suddenly "Locked in", during Many Hours, and over-Night, from 8 p.m. of Monday evening, up to around 4 a.m. of Tuesday Morning, (some even longer), with UnCertainties and Anxiety dominating most Moods during all this Time, particularly as the Killer or Killers had Not yet been Found by the Police, and still Circulated Free DownTown ! (See, f.ex., inter alia, also : ..., etc). >>> But, a Main Point of what he had to say then, (particularly on the New UNO's "Terms of Reference" for an eventual Resumption of succesful Top Diplomatic Talks with the Turkish side asap), was particularly Important for Europe, since it concerned not only the immediate and Long-term Future of one of its Member States, but also its Relations with Neighbouring Turkey, as well as EU's Direct Energy Supplies from Cyprus/Israel/Egypt+ agreed Cooperation, particularly after Recent Findings, in addition to Stability and Peace in a Strategic Area, facing Suez Channel, Lebanon Syria, Israel, the Palestinian Authority and the whole Middle East, (etc). - At any case, all these Facts, (and much More, in Other Cases of Islamist Terrorism too), clearly show that the Surprizing Lack, in Today's Anti-Radicalisation Meeting in Strasbourg (Comp. Supra), of any Representative from the Foreign Ministry of France, who could be well Aware of all the Foreign and Diplomatic Policy stakes, links and interests, eventually existing in this or that event, might prove to be regrettable. Indeed, a given Terrorist Risk might appear to be mostly "Endogenous", (Comp. Supra), But, in our Era of Globalisation, it's often Impossible to Pre-Judge a priori that such a MultiFacet and Tricky Problem as an Islamist Terrorist Incident, might, eventually, be Exclusively, 100% "Endogenous" or "Exogenous", since, many times, Internal and External Factors criss-cross eachother, in real practice, and/or are somehow, more or less Associated. If some claim that it was "Endogenous", then, How could they Explain the Fact that Most of ISIS' Members arrived from Various Other Countries, mainly through Turkey, from where notoriously Transited also ISIS' Arms Supplies and various Other Logistic items, while also Transited ISIS' "Exports" in Smuggling stolen Oil/Gas, even Ancient Cultural Heritage items, etc. ? But, Meanwhile, it's also a Fact that, a former City Counselor, who had come from Turkey in Europe in order to study ... "Turcology" in Strasbourg (sic ! ), and Famous for her alleged Knowledge of "Belly Dance" (re-sic), suddenly Changed a Popular initial Plan of Strasbourg City to Build a Tram Station among Family Homes in a heavily inhabited Suburb, (which would be called "Victor Hugo" Station), and, withOut any Concertation of the concerned Population, Imposed to Cancel that Tram station, and to Put, in its place, a Big Islamic Mosque, (which had been, initialy, scheduled for anOther location in that Suburb). So that, afterwards, all those numerous Inhabitants of most Family Homes, are still Obliged to Walk accross Too Long Distances by Foot, (even in the Rain, Snow, or Heatwave, etc), almost 1 km away, before they can reach anOther, Older Tram Station, located Too Far Away from their Homes. However, this wasn't enough : Real Practice proved that, in fact, there were Not Enough People who needed such a Mosque there, so that its First StoneWalls, were soon Abandoned, any Building activity was Stoped for too Long, to the point that Rain and Snow, etc, were progressively transforming those Abandoned Walls into Ruins... Suddenly, just a few Weeks after the 1st Islamist Terrorism Horrible Massacre in France against "Charlie Hebdo''s Journalists, back on 2015, appeared an UnKnown Stranger with a White Djellaba, who later was found to be a Representative of ...Quatar (sic ! ), and, immediately, Money was found (from Abroad) to Finish the Building of that Mosque in that place (that the Local Population had proved that they didn't care so much about building it there, or elsewhere, or not at all : Comp. Facts Supra). So that, still Today, all the Children living in the numerous surrounding Family Homes, instead of having (as it had been initially promised) a brand new "Victor Hugo" Tram Station Near their Homes, on the Contrary, they face only a "Quatar" Mosque, and are Obliged to Walk too Far Away before reaching some other, old and Remote Tram Stations, exhausted. (Meanwhile, that controversial Turkish former City Counselor Quarelled with the Majority of Strasbourg City, Resigned and Abandoned her post, Leaving to make a another Career Elsewhere, apparently not giving a damn for those Poor Children, Mothers, Old People, etc, who are Deprived from the promised normal Public Transports near their Homes). Soon, most French and/or Other European People progressively ... Abandoned that Suburb, around that precise area, which became almost Exclusively Full of Only some Ostensibly Islamized Groups, who Monopolize those Streets as Never seen Before in the History of that Strasbourg's suburb, Risking to be transformed in a Cultural Ghetto, (where, on the Contrary, used to live Together, Various and Diverse Communities, European and Not European, in Harmony, in the Past). Now, is that Turkey and Qatar provoked Problem, ... an "Endogenous", or an "Exogenous" one ? But, who really Cares about these Poor Children's Future ? + And, it's another Immigrant from Arab Countries, nowadays a serious and efficient Driver in Strasbourg, who asked, Recently, "Eurofora"s co-Founder, about the Fact that, as he characteristically denounced, ..."just a few Kms away from your European Institutions' Quarter, is located a Suburb with Low-Cost Family Homes, where I live, withOut almost Any French or other European People, still staying there, no more, Contrary to the Past. How can our City develop well, and Live Harmoniously Together, with such Separated (Cultural) Ghettos ?, he rightfully Wondered in substance. At any case, Meanwhile, the Brutal Murderer of 5 innocent Civilian People at that December 2018 Islamist Terrorist Attack (Comp. Supra), had reportedly transfered his own Residence at a Nearby, Adjacent Suburb ("Poteries", Western Strasbourg area), ...close to that Qatar-paid, Post-Charlie Hebdo massacre (Comp. Supra), displaced Mosque. 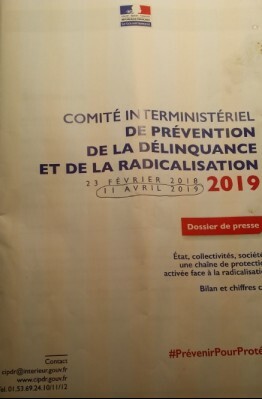 => At least, shouldn't Prime Minister Philippe's brand new "Scientific Councils on the process of Radicalisation" (Comp. Supra), include "Researchers" Both on National and International Issues, in order to become able to have a Balanced and Full View of what really is the Heart of the Matter ?